The Allie 24 inch vanity brings to you good looks and generous storage. An uncomplicated design scheme gains luster from the sophisticated Twilight Gray finish with brushed silver trim and hardware. A solid birch wood frame, plywood drawer boxes, dovetail joints, a convenient toe kick, and soft-close glides and hinges testify to the quality of construction. A large open shelf provides ample storage. Complete the look with matching mirror, mirror cabinet, and linen tower. Allie is all you need to make your bathroom amazing. The Austen 48 inch vanity is simple yet stunning. The Austen Collection features a minimalist design that pops with colour thanks to the refined Twilight Gray finish with brushed silver trim and hardware. The cabinet features a solid wood birch frame, plywood drawer boxes, dovetail joints, a toe kick for convenience, and soft-close glides and hinges. Complete the look with matching mirror, mirror cabinet, and linen tower. A perfect choice for the modern bathroom, Austen feels at home in multiple design settings. Dexter 43 inch Vanity Only in Rustic Gray The Dexter 43 inch vanity offers a combination of styles where country meets contemporary. From its Rustic Gray finish to it striking metal inset, Dexter blends rural and industrial details to create an intriguing cabinet that will be the centrepiece of your bathroom. A solid ash wood frame, soft-close hinges, and simple pulls finished in black bronze complete the look of this unpretentious but beautiful piece of bathroom furniture. A matching mirror is also available. Dexter defines modern bathroom design. 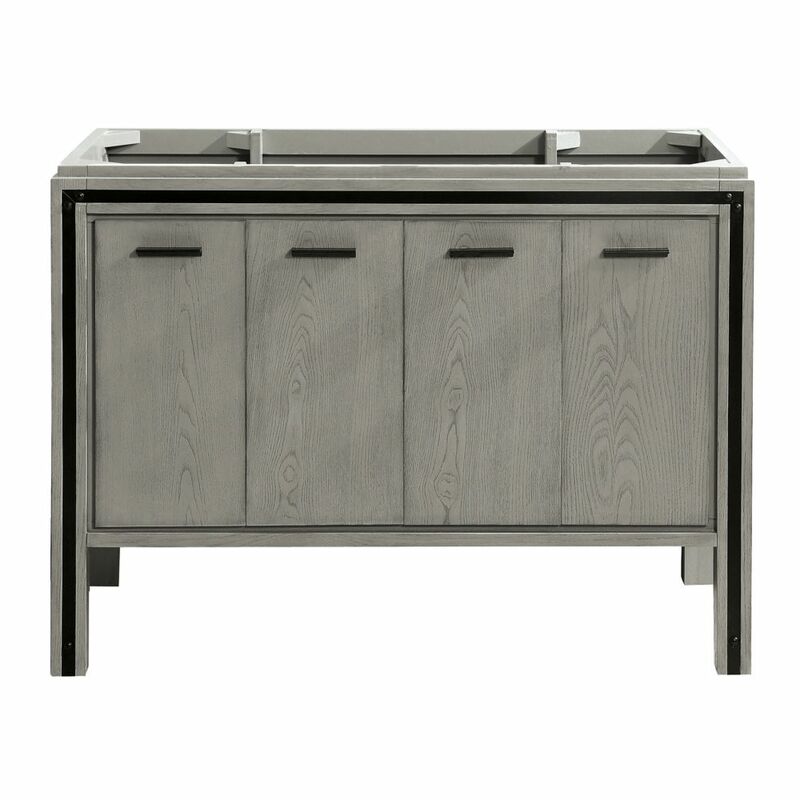 Dexter 43 inch Vanity Only in Rustic Gray is rated 3.0 out of 5 by 1. Rated 3 out of 5 by Ron from Drawers require too much effort to open on a daily / mourning routine. The vanity should use push... Drawers require too much effort to open on a daily / mourning routine. The vanity should use push to release drawers. I liked the deep pull out design but the two small trays at the top basically made them useless, one long tray would be much more useful. Great beautiful design but not practical for daily use.